On our last adventure we found ourselves at the City of Rocks in Idaho. Got there after dark, found a camp spot, and settled in. The next day we explored the area and found an arch. I couldn’t actually get under the arch but I did manage to stick my camera under it and click a shot. To my surprise I found another arch hidden within. I made more photographs and came up with this interesting view. 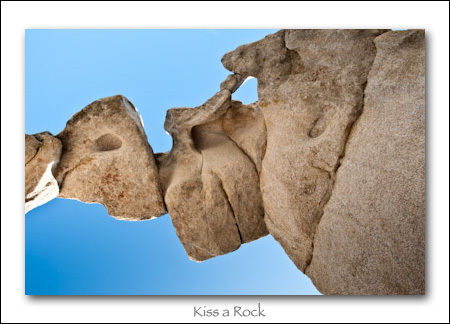 Looks like a rock figure kissing another rock. Let me know if you see it or if I’m stretching my vision.